How ironic it was last week to hear the BBC leading its news on that Commons report claiming that our “democracy is being destroyed” by the flood of “fake news” spread by social media. In fact, thanks to the relentless bias of its own coverage of so many issues, there is no more influential source of “fake news” than the BBC itself. Here are two glaring, but far from untypical, recent examples. The first began earlier in February with puffs on the BBC News website and Radio 4’s Today programme by Roger Harrabin, the BBC’s “environment analyst”, for a report by a body called the Institute for Public Policy Research (IPPR), warning of “multiple crises” that threaten to “destabilise” the world’s entire environmental system. Particularly striking was a repeated claim that, since 2005, thanks to climate change, there has been a 15-fold increase in floods across the world and a 20-fold increase in “extreme temperature events”. This seemed so startling that it prompted Paul Homewood, the diligent statistical analyst, on his Notalotofpeopleknowthat blog to track down the evidence for these claims. It turned out that they originated from a database of natural disasters, EM-DAT. According to Homewood, this showed that the chief reason for these rocketing increases was a very significant change in the way such “disasters” were being recorded, to include thousands of more recent events that would previously have been far too small to register in the global figures (the IPPR itself warned that these figures should, therefore, be treated with “caution”). But then Homewood found that the IPPR version was taken from something cited as the “GMO White Paper”, which might have sounded scientific. In fact, the “GMO” stands for Grantham, Mayo, van Otterloo, the asset management firm run by Jeremy Grantham, who also funds the Grantham Institute on Climate Change at two London universities, Imperial College and the LSE (similar figures have been quoted by Lord Stern, the chair of the LSE branch). Even the BBC realised that it had come rather a cropper on these claims. Subsequently, it allowed for at least a partial correction, aided by Mark Lynas, the climate campaigner, and the authors of that disaster database to which Grantham attributed his figures. But the impact of this was infinitely less than that of the coverage by Harrabin. It was he who, back in 2006, was the organiser of that “secret seminar” between top BBC executives and green activists, which led to the BBC policy that – despite its statutory obligation to report only with “impartiality” – because the science on climate change was now settled, there was no need to give “equal space” to views that questioned it (with results so much in evidence ever since). For a second, quite different, example, there could be no better measure of how far the once revered BBC World Service has degenerated than its bizarre recent celebration of the 40th anniversary of the seizure of power in Iran by the Ayatollah Khomeini. Its centrepiece has been a still continuing multi-episode “dramatisation”, Fall of the Shah, portraying the Ayatollah being welcomed by cheering crowds as the liberator of his country from the corrupt and tyrannical Shah. Other programmes focused on the “successes” of Iran’s Islamic revolution: better education of women and recovery of national self-respect, with the main aim of its foreign policy being to promote “stability” across the Middle East. If Iran has grievous economic problems arousing mass popular protests, these programmes suggested, they are mainly caused by President Trump’s reimposition of sanctions. One could scarcely have guessed from all this that Iran’s Islamic fundamentalist regime is one of the world’s most ruthless dictatorships with, per capita, the highest number of executions, including public hangings; that much of its economy is corruptly controlled by the Islamic Revolutionary Guards Corps (IRGC), its equivalent of the old Soviet KGB; that most of the $100 billion (£76.5 billion) in Iranian assets unfrozen by the West under that dubious nuclear deal was seized by the IRGC to finance its propping up of the Assad regime in Syria and fomenting terror across the Middle East, from Yemen to Afghanistan; and that this in itself, rather than using the money to boost Iran’s failing economy, has been a central message of those desperate recent mass protests. Yet another dismal triumph for the BBC’s very own “fake news” machine. 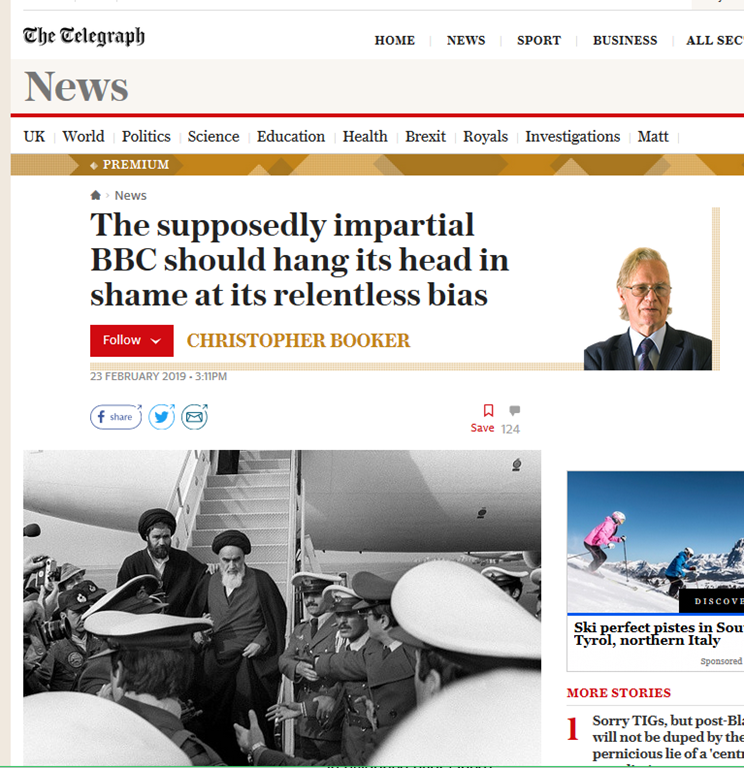 The frustrating thing is that Booker could fill his column every week with similar examples of fake news from the BBC. As for the BBC, this IPPR story exemplifies just how broken their coverage of climate change has become. Harrabin may have not been competent enough to spot the absurdity of the IPPR claims, which he was happy to headline. But inviting the opinions of a wide range of experts would have quickly uncovered the error. Instead all he did was quote two scientists, Simon Lewis and Harriet Bulkeley, who were so biased that they failed to even question the claims. The Today programme followed up the story, and inevitably fell into the same trap, interviewing Joanna Haigh, the hopelessly biased Co-Director of the Grantham Institute at Imperial College. Unsurprisingly she fully backed up the flawed IPPR report, never deigning to mention that her own employer had been ultimately responsible for a grossly misleading report, which was then blown out of all proportion by her chums at the BBC. If the BBC want to avoid broadcasting such patently obvious fake news in future, they really must be prepared to ask the opinions of a much wider section of opinion, and not just the narrow circle of prejudiced, well funded insiders, who are only prepared to give answers which suit their agenda. Anyone want to tell me why they happily pay the BBC tax, one of the few taxes it’s perfectly easy and legal to avoid? Because you have to pay the licence fee even if you never watch the BBC. It is a legal requirement if you watch ANY terrestrial TV (eg. Sky, ITV, C4 etc). My wife and kids watch numerous TV programs on terrestrial and I watch the news and the odd documentary. True, we don’t watch much terrestrial TV these days as we have Netflix etc but I believe in being honest and paying my taxes. My problem is that I do not agree with the licence fee as it goes to the Biased Broadcasting Coop which we rarely of ever watch. I would prefer it be replaced with a subscription based system for the BBC so I could choose to not pay for a subscription (as I’m sure millions of others wouldn’t either). That is one of the reasons I like the UKIP Manifesto as it is the only one I’ve seen that promises to scrap the licence fee. Sounds reasonable, if you want to watch anything off-air, by the somewhat dishonestly named ‘freeview’, rather than use on-line catch-up service you’ll have to pay. I was not suggesting you break the law. Mud4fun suggests a Land Rover somewhere. Good man. Every night I ended up watching DVDs rather than the routine daily broadcast of bumsex, fake news and climate change drivel. So I got rid of the TV set and bought a projector, a soundbar, connected all to an old PC and now watch the cinematic experience on the living room wall; nearly 4 years of zero TV Tax buys a lot of quality viewing. I rid my home of TV on February 1, 2013. I actually kept it a month longer in order to watch my high school band perform in the Tournament of Roses Parade in Pasadena, CA. I watch programs on youtube including President Trump’s speeches in full length. There are a number of series I follow from quilting to adventures in a tent/cabin in northern Minnesota (makes me appreciate how warm it is here), building a log cabin in Canada, 18th Century Cooking from Townsends in IN, history, archaeology, geology, and several political ones. The sooner the Telly Tax is abolished, the better. I’m surprised the Sunday Telegraph still publishes Booker’s heretical views. They go as far as they can to hide him. His column space was given to that ignorant scumbag Hannan while his column moved to the supplement. One of his recent columns was suppressed from the website which when I challenged them over it they simply said it was theirs to decide what appeared there even though it was in print. The Telegraph excels in fake news itself when it comes to Brexit – the honourable Booker excepted of course. The post implies that some at the BBC are acting out of naievety, but they know what they are doing, even if they don’t dare fully admit it to themselves. Like all state institutions (where only blind loyalty to a set of ideals centred around increasing the wealth and power of state institutions matters), they have become a beacon of mediocrity. In this atmosphere, talent and ability cease to matter, and staff are hired on the basis of brainlessness (any useful or skilled work is done by freelancers). There will be very few people left in the organisation capable of holding an original, independent thought. The appeal of authoritarianism (especially the kinds easily hidden under layers of self-fellating pseudo-moral righteousness) to these types of overgrown babies is that it has the potential to reduce all of society to their level of helpless vapidity, eliminating any threat from the real, non-ideological world to their job security and fragile self esteem, and they are willing to stoop to any level of corruption to promote it. You are absolutely right they know exactly what they’re doing. Someone there must be bright enough to equate the ‘they are in the pay of big oil’ argument. Anyone remember Joanna Haigh explaining the ‘Hockey Stick’ graph on television? Care to ask her how that’s doing? Did you see the hysteria about “climate change” wiping out a cute looking rat on a South Sea island hyped on “Beyond a Hundred Days” last week? Practically drowning in tears and demands that “something must ne done”. Mostly coming from the two, otherwise sensible, presenters who spend a lot of time flying! Apparently the rats were wiped out by rising sea levels. Nothing else on the island was lost and the risk to the rats was long known – but no one tried to rescue them! The “scientist” presenting this catastrophe (!) looked very pleased with himself but actually presented no cogent explanation for the “damgerous extinction”. I have not seen the program and I have no wish to. But, if it what I think it is, the item is a very old piece of rubbish. CAGW fanatics claim that hundreds, thousands, millions – choose your favourite hysterical scream – of species will be wiped out. This funny critter is the ONE they think they can lay claim to and therefore of course the hundreds, thousands, millions are on their way out…It is really just an example of a tiny population which adapted to a particular small niche in one place and is now disappearing. In the long course of evolution there must have been literally trillions of such happenings. People forget that Charles Darwin was regarded as a danger to Religion not because he contemplated evolution but because he contemplated the necessary accompaniment to evolution – extinction. God was supposed to have deliberately made an exactly balanced world. If a perfectly good species can die out this means He made a mistake in creating it in the first place. Blasphemy! Because of my professional experience of the BBC’s misleading and treacherous practices I have kept as a link on my homepage the devastating criticism dated 26 April 2016 by Lord Monckton et al which appeared here but never went to judicial review. Ch8 destroys Attenborough. My hatred of the BBC remains unassuaged. Harabin, (or Horobin, as John Shepherd misnames him in this EA e-mail), has been an insider from the outset and attended the Tyndall advisory board. BBC insiders say the close links between the Corporation and the UEA’s two climate science departments, the Climatic Research Unit (CRU) and the Tyndall Centre for Climate Research, have had a significant impact on its coverage. In 2007, the BBC issued a formal editorial policy document, stating that ‘the weight of evidence no longer justifies equal space being given to the opponents of the consensus’ – the view that the world faces catastrophe because of man-made carbon dioxide emissions. Roger Harrabin | Changing Climate | 8pm @BBCRadio4. Roger is currently supporting OU-led project Stories of Change: http://www.open.edu/openlearn/nature-environment/the-environment/creative-climate/stories-change/about-stories-change? ‘An enterprising newsdesk might enquire how much the BBC spends on politically correct courses and who runs them. As for Cardinal Harrabin — for that would have been his rank in Galileo’s day — times are good. The BBC at its biased best (as I type) with just one voice of reason so far among a jeering bunch of pseudo religious climate zealots, on today’s truly awful “The Big Question”. Not available on iPlayer yet so I can’t comment. I am amazed that there was even one voice of reason. For some reason I can’t stand Nicky Campbell but I will force myself to watch, when it is available. Absolutely correct enough to make you want to throw up. All Nicky Campbell had to do was ask for a show of hands on how many of them had flown in the last twelve months and when displayed ask the simple question on short or long haul? I think the co leader of the Greens would have struggled with that one. Sky is no better now. I switched to watching sky news about 4 years ago. At the time they were far less biased than BBC. Even up to about 6 months ago, while obviously having some bias, they did at least give decent air time to both left and right, remainer and leaver. Their morning guests often made us laugh with the obvious friction between some of the more right leaning or worldly wise guests such as John Nichol or Kriss Akabusi and the extreme left wing numpties such as Own Jones. Even Adam Boulton seemed to be towing the line to a degree upto 6 months ago. Now however all the sky presenters are in supercharged anti-Brexit mode. This morning I watched a couple of interviews with Adam Boulton and it was cringeworthy, Boultons clear bias showing with his constant use of project fear words such as crash out, fall over the abyss etc when referring to leaving on WTO terms and then giving a brexiteer barely 2 mins to speak (and most of that was interrupted by Boulton) before switching to an extreme remainer who had a full 5 mins uninterrupted to spout the usual nonsense about wanting a 2nd referendum where the only options must be ‘Mays Deal’ or ‘Remain’. Curious that these remainers who say they do not wish to simply stop Brexit seem to vote against Mays deal in parliament and tell us that it is so bad that it will never be acceptable to parliament and yet when choosing options for a 2nd referendum only want Mays deal as the leave choice. To me it should be Mays deal or No Deal, if they want the remain option then they will need to properly implement a preferred and 2nd choice system on the referendum so the leave vote is not split. Strictly speaking, as parliament itself doesn’t see Mays deal as fit enough for them, I fail to see how it could even be placed on the referendum poll card. Sky is also now on overdrive with their global warming meme too. Spewing out fake news about extreme weather, heatwaves, melting arctic and how wonderful renewables are on an hourly basis. It is almost as though since we voted for Brexit the elite have woken up and realised that they haven’t fooled the general public and they need to ramp up the rhetoric. Of course it is having the opposite effect in that we are all now turning off the TV and going to blogs like this instead! I’ve now given up all hope that the British liberal/metropolitan elite will see sense. It seems to me that we are headed for a civil war in the UK, possibly within 20 years. The British public are not as tolerant as the liberal elite believe and we are truly fed up of our quality of live and values being sacrificed for the benefit of minority groups and quasi religious ideology whether that be from the greens, LGBTxyz or the muslims who see the UK as a future caliphate. I think the silent majority of British public, who have in the past been too ‘nice’ or even too ‘conservative’ to go out on protests and properly fight for their cause, are reaching the point where they need to stop being so nice. The only way to combat the dirty and vile goings on from the left is to fight it on equal terms. Being nice gets us nowhere other than being walked all over. This is why I believe the likes of Tommy Robinson, for all the fact that he is a thug, may well be needed in the fight for freedom and I suspect we’ll see growing support for him over the coming years, even from the previously moderate conservative sections of the public. RT is better than the BBC or Sky now. At least they have some informative and interesting reports, and unlike the BBC nobody will accept what they say without question. Paul, would be worth you having a look at yesterday’s 100 Days on the News Channel. They tried to claim that because yesterday was warm and it snowed on the same day last year = climate change and then gave Gina McCarthy free range to spout all sorts of nonsense about climate and Trump’s new assessment. Kids wondered why I was shouting at the TV so much it really was a dreadful fact-free zone. It’s potentially worth a complaint. Do you know roughly how far in? It’s OK, I’ve found it now!